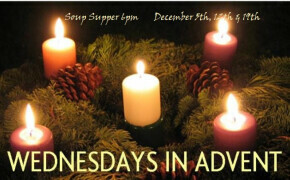 Wednesdays in Advent! 6:00pm -7:30pm Come join us during Advent on Wednesday evenings to re-center and refresh as we prepare for Christmas. Join us on December 5th, 12th & 19th! Sign– up in the lounge if you can attend and if you can bring a dish. The service on December 19th will be a Blue Christmas service. This service is set near the longest day of the year to remember the light that shines in the darkness. This service is especially meant to remember those for whom this season is difficult.